Launched in January 2017 and concluded in November 2017, this scoping project was funded by GIZ and implemented by REEEP. The project mapped out dairy value chains and consulted stakeholders to find technology and knowledge gaps, and proposed ways to address those gaps. Over the course of almost a year, REEEP conducted an intensive review of relevant literature and consulted over 100 dairy stakeholders in India and Kenya. This process resulted in a thorough understanding of the challenges and opportunities of the dairy value chain, and it helped build valuable relationships with and between stakeholders. 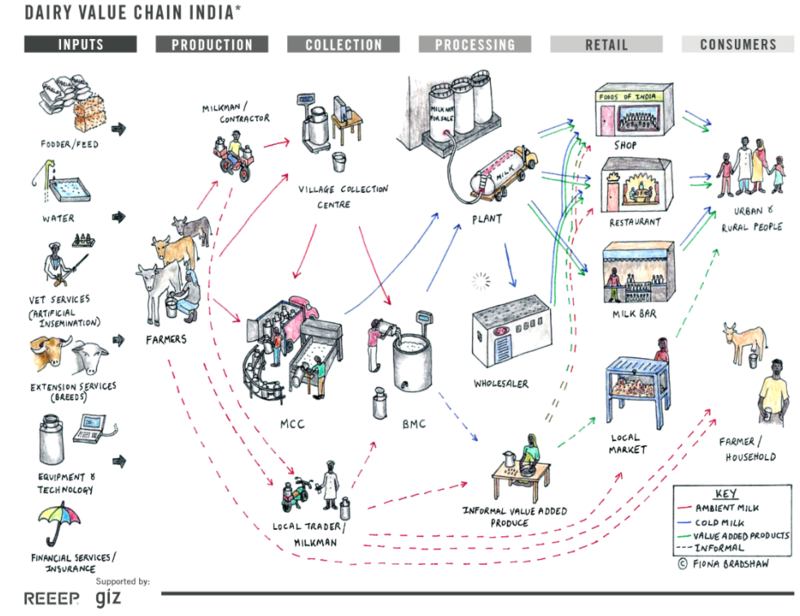 One of the major outputs of this project are two graphics depicting the value chains. We developed a first version of both graphics based on literature and learnings from field missions. We presented these illustrations to assembled stakeholders at two workshops in Delhi and Nairobi, and fine-tuned them by incorporating the stakeholders’ feedback. For a quick overview of the outcomes of our scoping study, check out this brochure. 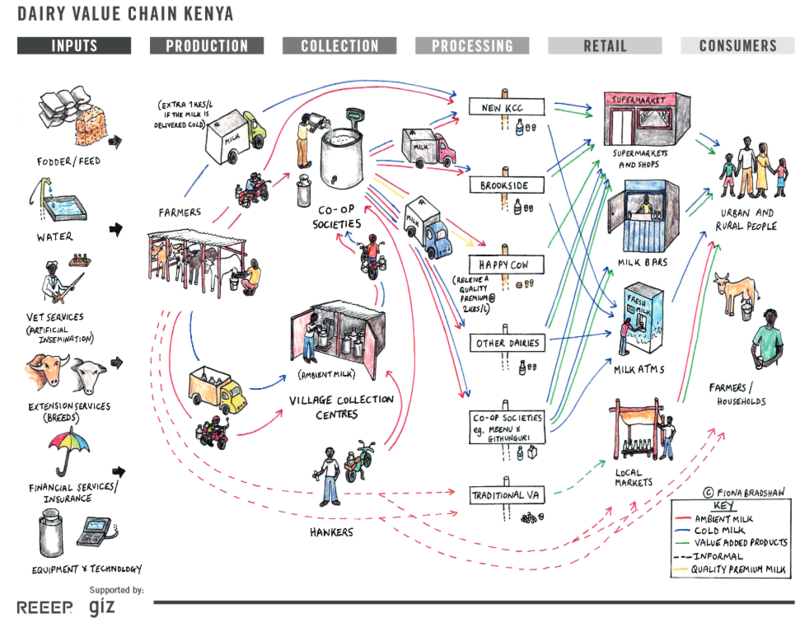 It includes both value chain maps, and gives an insight into the main challenges faced by actors in the dairy sector in India and Kenya, as well as a number of possible solutions. While the dairy sectors in both countries face a number of similar challenges, there are also some striking differences. In both countries, over 80% of all milk in the value chain is produced by small dairy farmers with just two or three cows. Up to 50% of the milk these farmers produce is consumed directly on-farm, and of the marketable surplus 70% (India) or 80% (Kenya) is sold to traders in the informal sector. The remaining milk is sold to private dairy companies and co-ops and thus enters the formal market. In India, we found that the formal dairy sector was rather well developed, with most small-scale farmers living within easy reach of a local collection centre. Fresh milk is picked up twice a day, and reaches the first chilling facility within 3,5 hours. Losses due to spoilage are negligible. Farmers are able to get a good price for their milk, and farmers’ groups and co-ops are historically strong and influential. Based on our findings, we see potential to “green the Indian dairy value chain” by replacing outdated conventional chilling technology, which is expensive to run, with energy efficient alternatives. This will lead to savings in terms of cost as well as GHG emissions. For more information on India's dairy sector, also see our earlier REEEP blog describing the field mission to India in May 2017. The Kenyan dairy sector, on the other hand, is at an earlier stage of development; farmers cannot reliably sell surplus evening milk onto the formal market since milk is only picked up from village collection centres once a day. The cold chain is not yet well established and post-harvest losses at farm level are estimated to be high – though reliable data is lacking, stakeholders and literature estimate the rate of spoilage at farm level at 6 to 40%. The formal sector is in the hands of a limited number of large private dairies, and Kenya’s “milk hawkers” in the informal sector are notorious for tampering with milk (adulteration) and bringing down quality. In Kenya, we see a need to “improve the dairy value chain from end to end”, focussing on milk quality starting at the production stage. Clean energy and energy efficient technologies form part of the solution, but not the only or even most urgent part. We have concluded this project with a concept note outlining suggested interventions for both countries, and we are glad to be able to continue our work with the support of GIZ. In the coming months, we will have a more thorough look at the opportunities for interventions in India’s dairy sector, leveraging our learnings thus far and building on the relationships created over the past year. Stay tuned, as we will continue to report on our activities on reeep.org!